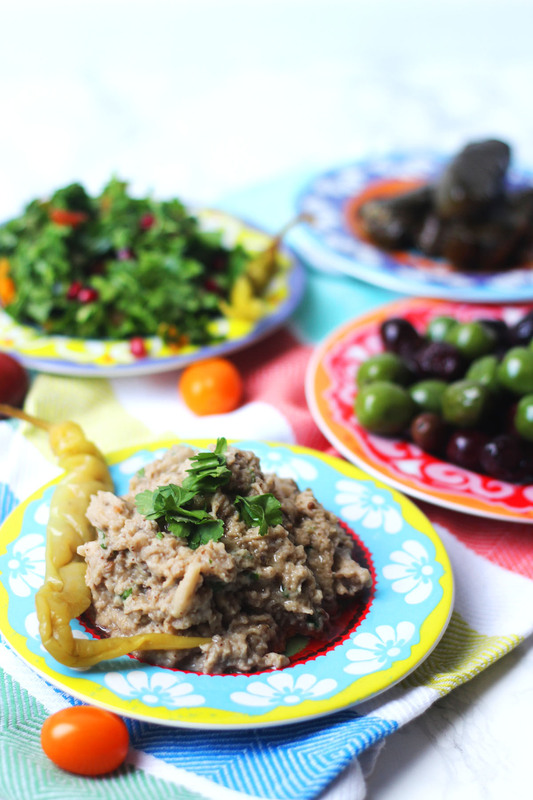 I’ve been playing with my Optimum Pressure Cooker Pro creating quick and easy recipes like this simple Baba Ghanoush! Scroll down for the recipe. One of the best things about living in a multi-cultural city like London is being able to find delicious food from around the world at almost any time of day. The area in which we live has large Turkish, Greek and Cyrpiot communities. As a result we have some fantastic restaurants and our local shops are packed full of imported goods like yogurt, halloumi, anaria (a bit like ricotta), endless jars of pickles, . Some of the larger stores even bake their own authentic breads and pastries. We really are spoilt for choice! One of my favourite treats has become patlıcan salatası an aubergine based dish that is served up as part of a Turkish meze. For those of you not so familiar with Turkish cuisine you may recognise this as Baba Ghanoush. 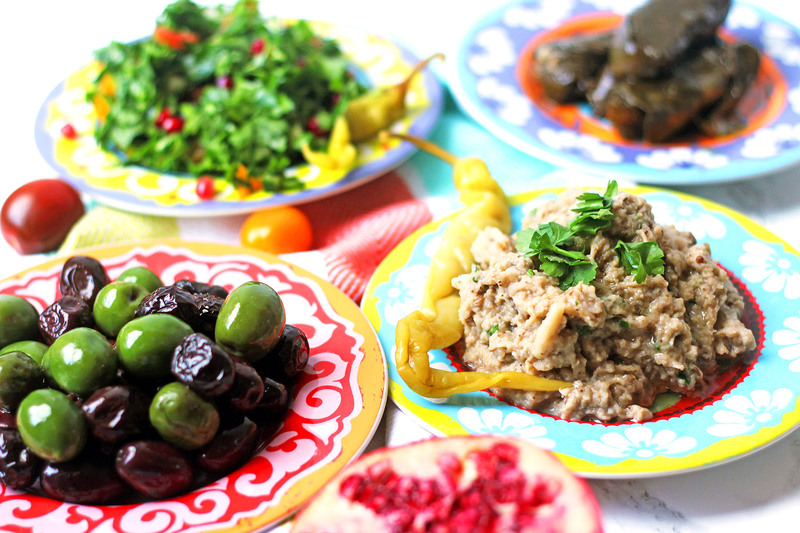 Although Baba Ghanoush is more well known as a Levantine dish, varieties exist all across the middle east, Africa, the Balkans and Eastern Europe. What most of them have in common are the main ingredient aubergines, garlic, olive oil and lemon. To give my version a more Turkish twist, I also add some tahini. I love how dishes like this develop and evolve as they move across the world, adapted for different peoples tastes and the ingredients they have to hand. Before you start adding your own little twists to this Baba Ghanoush recipe you have to first understand there are some fundamental principles to getting it spot on. First off, aubergines are THE most important element. These dark purple veggies are often criticised for being bland, bitter, soggy, sponges that soak up too much oil, and worse! Advocates often suggest brining or soaking them to improve their texture and flavour but there is one sure fire way to make sure your aubergines are delicious with a wonderful silky texture – roast them! This is often done over an open flame to get the skins really black (similar to making fire roasted peppers) with a smokey flavour. But I’ve found a slightly lazier method which involves my Optimum Induction Pressure Cooker (you can read my review of it here). The pressure cooker technique was originally recommended by Eat Myyy Thoughts. She also suggests you can get the same result from placing your aubergines in a slow cooker for 6-8 hours but I’ll admit I’ve not tried that yet. If you give this method a go do let me know how you get on in the comments! To cook them I simply chuck them in whole (stalks and all) and select the “meat” setting. It may sound a little counter-intuitive given that aubergines aren’t meat but trust me on this, if you treat aubergines too delicately you’ll never get the best out of them! After being in the Pressure Cooker for 60 minutes they come out blackened and soft. The flesh scraped out from the charred skins is the perfect base for my Baba Ghanoush. Once you’ve got your perfectly roasted aubergine you need to add a few other ingredients to really bring this dip to life. The next key ingredient is tahini. I have a love hate relationship with tahini as it can easily overpower a dish (hummus I’m looking at you!) which is why it’s used sparingly in the recipe below. Tahini is a condiment made from toasted ground hulled sesame seeds. It looks almost like a really runny peanut butter and has a nutty aroma. These days you can find tahini in most supermarkets. But if you want a really authentic taste then definitely keep an eye out for it in ethnic food stores. Our local shop has shelves and shelves of different varieties! Jon absolutely loves the stuff and is like a kid in a candy shop! If it’s the first time you’ve tried it opt for something simple and plain with no added flavours. Now here’s somewhere that Jon and I disagree. I really like sharp flavours. These long thin, green pickled chillies you can see in the photos are perhaps my most favourite thing in the whole world! With this in mind I do like to add a good squeeze or two of lemon to my Baba Ghanoush. Jon is less keen on being able to taste the acidity. The recipe you’ll find below therefore errs on the cautious side. Have a taste and if you, like me, like things a little more tart then add in another squeeze! The best thing about a dip like Baba Ghanoush is that it can be easily adapted for your taste buds! Pierce the aubergines skin with a sharp knife. Slice the garlic cloves and poke them into the slits. Place the aubergines into the Pressure Cooker and select the "meat" setting. Adjust the time and cook for 1 hour. Allow the aubergines to cool slightly then peel them by hand, pulling the soft flesh into long strips. Mash lightly with a fork and drain away any excess liquid. 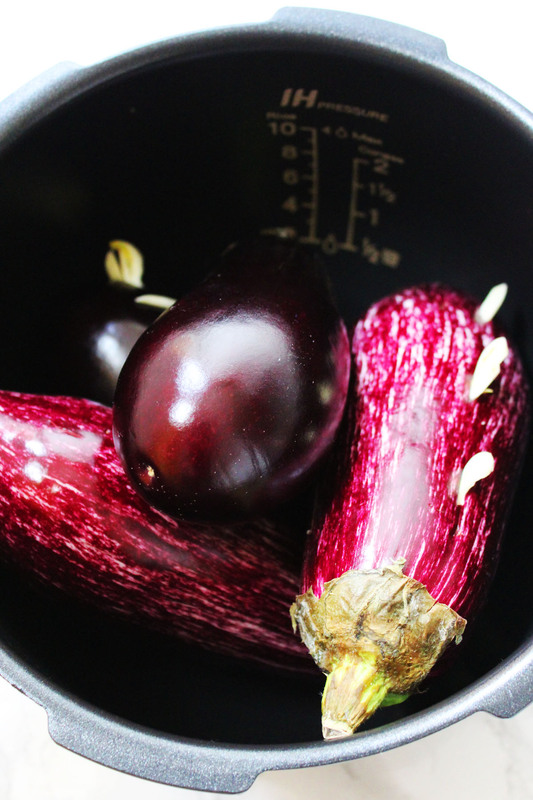 Place the drained aubergine in a medium bowl and add lemon zest and juice, salt and pepper to taste. Stir to combine (if you like your Baba Ghanoush smooth you can whizz it briefly in a blender at this point) and allow the aubergine to marinate at room temperature for at least an hour. Finally, stir through some fresh chopped parsley and drizzle with the olive oil before serving. Alternatively, cook your aubergines over a flame on the hob or BBQ, under a high grill or in the oven, turning frequently until the outside is black and the flesh soft. Then simply follow the rest of the Baba Ghanoush recipe as usual. spoon over caramelised onions for a rich depth of flavour. I’ve never heard of this dish before but wow it sounds incredible and so interesting. I can’t wait to try it! Oh you must! It is one of my favourite dips that’s for sure! I’ll be honest – I’m not a big fan of eggplant, but for some reason, when you put it in a dip form, it becomes something I can’t stop eating. Why is that? I need to make this recipe! I am exactly the same Lisa. In dip form it is EVERYTHING! I love baba ghanoush, but I’ve never actually made it myself. I bet it tastes even better homemade. That whole spread looks incredible! Oh you must heather! It is SO much better than store bought like you wouldn’t believe!!! If you like the look of the rest of it, I have a couple of tabbouleh recipes I’m sure you’d like too! This might just be one of my favourite foods ever. I can never make it like my local Lebanese place, but I will give yours a try and hope that it’s close. 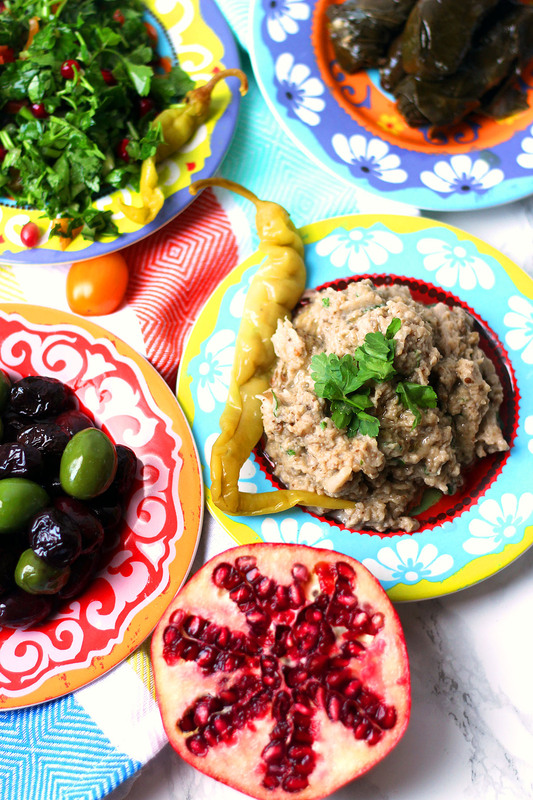 I adore baba ganoush and can’t wait to make this! Might have to try the slow cooker version as I haven’t put my pressure cooker into use yet. So good with houmous and pitta. Let me know how it goes when you do Lucy! I never quite got on with baba ghanoush when I lived in Egypt, but you’ve persuaded me to give it another try. I didn’t know you’d previously lived in Egypt 🙂 what a contrast to the South West 😛 Definitely have another go – you can always tweak it to suit your tastes! This sounds so good! I’m a HUGE baba ghanoush fan, but I’ll admit that I always buy it. I really must use your recipe and try it myself. I LOVE anything with aubergine and baba ghanoush is one of my favourites. Haven’t had it for far too long. I also love those colourful plates you’ve used – they are gorgeous! This is one of my favourite dips! Love the smoky melted aubergine and of course tahini! I eat waaaay more baba ghanoush than I care to admit hahaha. It’s my favourite dip too! Loving your Turkish twist on this recipe. It’s a great recipe. This looks absolutely incredible! Such wonderful flavors. I love that you used the pressure cooker to prep the eggplant. How perfect! Yum! We always get baba ghanoush when we eat out at Mediterranean restaurants, but I had no idea it was this straightforward to make at home! I know right?! Once you start making your own you won’t regret it! Love baba ghanoush! What a colorful spread you have here! !